On November 10, the Turkish commemorate the death anniversary of Mustafa Kemal Atatürk, the founder of the Republic of Turkey. Although Atatürk Remembrance Day is not a public holiday, it is marked throughout the country with a moment of silence. Mustafa Kemal was born in 1881. The surname Atatürk was granted to him in 1934, it means “Father of Turks”. Atatürk was the leader of the Turkish National Movement in the Turkish War of Independence. 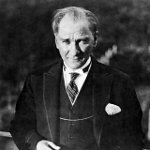 He established the Republic of Turkey in 1923 and became its first president. Atatürk's extensive reforms helped convert Turkey into a modern and secular nation-state. Mustafa Kemal Atatürk died at 9:05 on November 10, 1938. Every year, all of Turkey observes a moment of silence on November 10 to honor Atatürk's memory. At 9:05, sirens go off across the country. Everyone stops and keeps silence for a minute, remembering Atatürk and his accomplishments. Many people lay flowers and wreaths at Atatürk's memorials. Atatürk Memorial Day is not the only celebration dedicated to this distinguished leader. The main celebration dedicated to Mustafa Kemal Atatürk is held on May 19, it is a public holiday known as Commemoration of Atatürk, Youth and Sports Day.